Saving My...: Color Confusion Made Clear! Do you have color confusion? 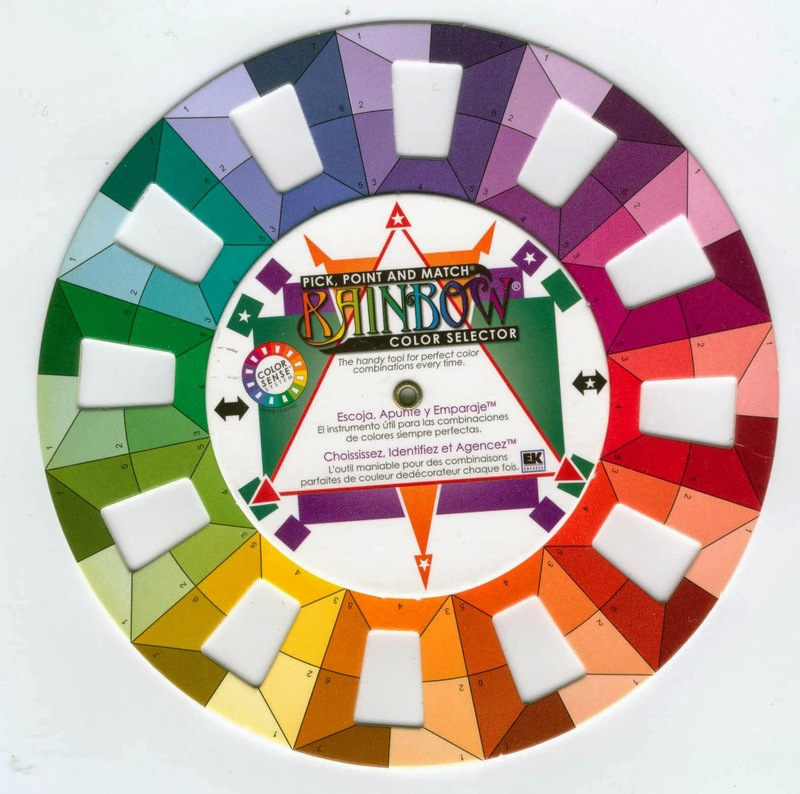 Are you intimidated by that color wheel? Today I'm here to help! I do get compliments on my colors, and I thought "it's really not that hard", but then I realized one thing. That color wheel can be darned confusing! There's no way to memorize all the possible combinations, and you might just sit there saying "what are all these shapes in the middle for?" This is the one I recommend, and it you can probably find it in the art supply section of your nearest craft store. You use the holes in the center of each color grouping to help you decide which one your paper matches best. (Obviously this wheel can't cover an infinite range of colors.) The center spins, as you can see in my video, to help you choose the combination of colors for your project. I forgot to mention analogous color schemes in the video. this is just a group of 3-4 colors in a row along the color wheel. So perhaps you might use yellow-green, green, blue-green(turquoise), and blue. Or a monochromatic scheme where you use varying shades and hues of the same color. Note - All of my layouts started with a sketch. My go-to sources are Scrapbook Generation and Close To My Heart, but some come from other sources and I also draw my own. This layout started with the die-cut paper, and I had some scraps of the stripe, both from The Girls Paperie Vintage Floral line. I pulled the blue from a small portion of the stripe for more contrast, using Frosted Teal cardstock from Bazzill as my bases. I added the green pattern from The Girls Paperie Vintage Travel line and the pink pattern from Basic Grey's Urban Prairie line. Title was cut with the Cricut Artiste cartridge, brads were from my stash, and all other embellishments are The Girls Paperie Vintage Floral line. I wanted to capture the feeling of a Creole plantation with this layout, reflecting the colors of the house itself. A perfect choice were these papers from Graphic 45's Olde Curiosity Shoppe collection. I added a journaling sticker and chipboard tag shape from the same collection. I used some felt flower shapes in my stash with the Epiphany Crafts Round 25 shape studio tool and bubble caps, some stickers from the collection and CS scraps. The title was cut with the Silhouette Cameo using Times New Roman and Black Jack fonts. This layout began with leftover items from this month's promotional Cloud Nine card kit from Close To My Heart. (I made 1 set of 5 cards instead of 2 so I had large pieces left.) All of the embellishments and stamped title shapes are from the same kit. I added White Daisy CS for my bases, along with Lagoon, Cranberry, Sunset, and a scrap of Honey CS. I added stamping from January's stamp of the month, Cross-Stitch Wishes for an arrow border and a few tone-on-tone hearts in the background. This layout started with a discontinued kit from CTMH, Avonlea. My color wheel declared Ruby red the winner of the add-a-color contest, so I added a few CS accents and some embellishments from the kit and the Ruby Mini-Medley Accents collection. The title is stamped with some discontinued stamps. This layout uses the ProPlayer kit right out of the package - the experts know what they're doing. But, you CAN add other colors if you choose. If you didn't watch the video yet, you can see there how to add more colors to this combination. The titles and gears are all cut from the Cricut Artiste cartridge. If you have any other questions about using a color wheel, feel free to ask them right here! I'm happy to help out.